Much like how writer/director Michael Dougherty brought some life into the Halloween genre with the criminally underseen Trick r' Treat, he manages to inject a gift inside the stocking of the Christmas movie genre with another gem that will hopefully become a B-movie favorite in the best possible way. Krampus follows the story of a family who is undergoing quite a dysfunctional Christmas. But when the son (Emjay Anthony) writes an angry letter to Santa, he accidentally summons the demon Krampus, who is the shadow of Santa Claus and is intent of punishing those that threaten to crush the spirit of Christmas. First off, I absolutely loved the concept. I loved the idea of a new kind of Christmas villain and how the villain serves as a grey area, threatening those who destroy the happy spirit of Christmas and potentially getting them to appreciate the holiday and their families more. Even if the villain is already a classic myth, it is still neat to include one as interesting as Krampus on the big screen. I also loved the designs of the various creatures. I loved how most of them looked practical with actors dressing as them. I've said it before and I'll say it again: I am not a big fan of CGI if it isn't necessary. So thankfully because they were able to use practical and makeup effects, they ran with it while using CG when necessary. I thought the acting was pretty good and how the characters are given different colorful personalities. One of my favorite actors in the film was Conchata Farrell as the sardonic Aunt Dorothy. She stole every scene she was in. Also, David Koechner as the hunting-loving uncle Howard got some good laughs out of me. One complaint that I have is with the ending. It wasn't terrible, by any means. But at one point before another reveal by the time the credits roll, it became a major copout and I was like "agh." But before the credits rolled, where the filmmakers hit the message home about appreciating Christmas more, it immediately won me over again. 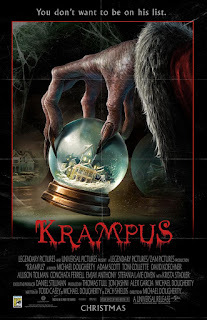 Overall, Krampus is a fun Yuletide frightfest that will have your sleigh bells ringing with laughter and scares. Despite its sloppy ending, I still had a great time watching this. It was nothing serious and incredibly deep, yet it absolutely didn't need to be.